This guest post is co-authored by Joshua Busby, associate professor of public affairs at the Robert S. Strauss Center for International Security and Law at the LBJ School at the University of Texas at Austin, and Sarang Shidore, a visiting scholar at the LBJ School at the University of Texas at Austin. This is the third post in a series on the topic of scaling up solar power in India, following posts in December 2015 and February 2017. The authors would like to acknowledge the support of the IC² Institute at the University of Texas. In late 2014, in the lead up to the Paris negotiations, the Indian government established an ambitious solar target of 100GW of installed solar generation capacity by 2022. At the time, India had about 2.5GW of installed solar capacity. Since then, India has made significant progress towards the goal and has installed 20 GW, perhaps as much as 9.6 GW in 2017 alone (for a slightly lower estimate, see here). However, while the 100 GW target was always going to be difficult to achieve, we are less optimistic than we were last year in the future prospects of India’s solar scale-up. The overall target might not be met by 2022, and the solar scale-up seems likely to slow down. Bridge to India, an energy consultancy, has estimated that India will not meet its 100GW target by 2022. Its current estimate is that India will install only about 55GW of solar by 2022, including about 44GW of utility-scale solar and 10.8 GW of distributed solar. Here are the reasons for our increased pessimism. Solar projects are threatened by rising costs. Solar developers have built projects at very low cost, and these projects are threatened by rising costs of Chinese solar panels and likely increases in taxes. Nearly all of the installed capacity (18.4 GW of the 20GW) has been large, utility-scale solar parks rather than distributed solar power on residential, commercial, and industrial rooftops. India has deployed large-scale solar power through competitive auctions, whereby would-be solar developers compete to offer the lowest cost of electricity to the grid and in return earn the right to build solar projects. As prices for Chinese solar panels have plummeted, there has been a steep decline in the electricity prices offered by solar developers. Bid prices have come down from more than 8 rupees, or 12 cents, per kilowatt-hour (kWh) in 2011 to as low as 2.44 rupees, or 4 cents, per kWh in 2017 for some projects. As we warned in our February 2017 piece, the price declines have been so steep that there is some concern that solar developers have not built in enough of a profit margin to ensure business viability if their costs increase. Moreover, other costs associated with solar, namely financing costs, remain high in India, though they have come down somewhat over the past years. As panel prices have declined significantly, other costs, particularly finance, have become more important in determining the total costs of solar. In 2016, the Council on Energy, Environment and Water (CEEW), a think tank that works closely with the Indian government, evaluated the costs of a solar bid in the Indian state of Telangana. They found that 70 percent of the bid cost was composed of financing costs, compared to only 20 percent for a comparable project in Dubai that had a much lower price per kilowatt-hour. CEEW noted that while cost of debt is around 5 to 7 percent in the United States, it exceeds 10 percent in India. The quality of many imported panels is unclear. As we signaled last year, there are concerns about the quality of imported solar panels, and it is unclear if these panels will hold up over 25 years as intended. A lack of quality controls means that it is difficult to tell what caliber of solar panels are being purchased by Indian firms, and there may be diminished generating capacity over time because panel quality is poor, particularly in rooftop installations. There has been some effort to roll out guidance on panel quality and inspections for panels, with standards to be enforced beginning in April 2018. Rooftop solar has taken off but has limited room to grow. The government had an initial goal of expanding rooftop solar to 40GW as part of its 100GW plan. This aim has largely been shelved. Though rooftop installation has tripled over the past year and is now up to over 1.5GW, most analysts think that this growth will slow, and India will have at most 10-12GW of rooftop installed by 2022. Developers have found that rooftop solar on commercial and industrial properties makes for good business and have quickly implemented a lot of projects with customers who can reliably pay them. As developers are financing most of the capacity, it is getting harder for them to find customers who they think are low risks for non-payment. Some assessments see the rooftop sector’s growth having occurred despite of, not because, of policy decisions by the Indian government. Few policy instruments have supported the sector’s growth, save for $625 million in subsidized credit from the World Bank and $500 million from the Asian Development Bank that were approved in 2016. Efforts to support net metering, which allows solar system owners to get credit for electricity they produce, have been met with considerable resistance. There is excess power generating capacity in many states. Economic growth and industrial demand have not increased by as much as anticipated, meaning that expected demand shortfalls have not materialized. As a consequence, new solar projects are coming online at a time when there is excess generation capacity in many states. In November 2017, India had an installed capacity of about 330GW of electricity while its peak demand was much lower at 164 GW. This surplus could tempt electricity distribution companies to renege on their contracted payments for solar electricity if excess coal-fired electricity is on offer for a lower price. So far, coal has borne the brunt of the consequences of market oversupply, and some firms have had to shut down older, less efficient coal burning power plants and to run some coal plants below their typical plant load factors. That trend may soon run its course, however, because the remaining old coal plants are often the cheapest source of available power. In comparison with new coal power plants, though, solar remains a much more attractive proposition. Of the 50 GW of new coal plants slated to be built through 2022, it is not clear if many of them will ultimately be constructed. Distribution companies are still in trouble. We also warned that the electric distribution companies (DISCOMS) in India–which purchase electricity from solar projects and distribute it to end-customers–remained heavily indebted, despite aggressive efforts by the government to help them clear their balance sheets of debt. This increased the risk that distribution companies would fail to pay for solar electricity in the long run, which would make the solar projects unprofitable to build. Enacted in November 2015, UDAY is the acronym for the government’s effort to bail out the struggling distribution companies by transferring their debts to state government balance sheets and trying to help them become solvent by removing the factors that led to losses, such as reducing transmission losses and chronic underpayment. Even with the UDAY scheme, many of the same factors that led to unprofitability in the first place, like the need to offer low-cost power to farmers, have not gone away (except for undercollection of electricity bills, which is improving). Technical losses in the system, which are high at more than 20 percent of the generated power, are not being reduced fast enough. Most distribution companies are still not in good shape. In May 2017, about half of the distribution companies were graded as B or lower for below average operational and financial performance capability or worse. This was comparable to the previous year’s ratings. The government is sending mixed signals about its commitment to its renewable energy goals. On the positive side, the Indian government has announced plans for solar mega-auctions of 20GW for 2018. We have seen fewer auctions than some anticipated, but there are efforts to keep the pipeline of projects going with a lot of capacity being bid out at once. The International Solar Alliance (ISA), an intergovernmental organization launched by Prime Minister Modi, headquartered in India, and signed onto by 121 countries, also entered into force in December 2017. The visibility of the ISA enhances the on-going political significance of solar to the Modi government as it prepares for elections in 2019. However, on other fronts, the government’s commitment to solar is wavering. Revenue collections from a tax on coal that went to the National Clean Energy Fund aimed to fund climate and renewables goals will now fund other programs, including compensating states for revenue lost through recent tax reform. Though solar panels were exempt from taxation under the old fiscal regime, the newly introduced tax reform, known as GST, taxes solar panels at 5 percent. The government is also considering applying two new tariffs on imported solar panels, which could have serious implications for the costs of new solar projects. The Modi government may issue new solar tariffs. India tried to develop its own subsidized panel production industry, but this has largely failed. The U.S. successfully pursued a WTO case against India for unfair local content rules in support of solar. Without the local content rules, Indian firms have had trouble competing with the Chinese panel producers that now dominate the market. 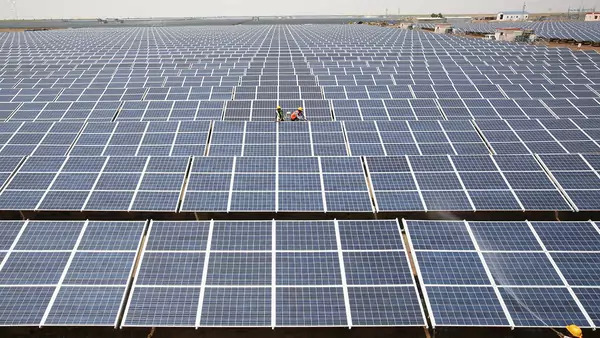 The Modi government is poised to rule whether Chinese solar firms are dumping their panels in India. Recent reports suggest India’s Commerce Ministry is considering a 7.5 percent tax on imported solar panels. The Modi government would like to boost domestic manufacturing capacity under its Make in India campaign, including domestic manufacturing of solar. More worryingly, a 70 percent additional safeguards tariff explicitly aimed to protect domestic manufacturers from “serious injury” is being considered by India’s Ministry of Finance. Although projects currently in the pipeline are expected to be exempted from this tariff, subsequent additions will almost certainly be dealt a heavy blow, as it may increase the sustainable price of bids by 20 percent to 40 percent, making solar more expensive than new coal power in most cases after extra costs of grid integration are taken into account. The United States just imposed tariffs of its own on imported panels, which will likely, as Varun Sivaram argues, lead to job losses in the U.S. solar sector and do little to make U.S. companies more competitive. These decisions could cause a sharp increase in the prices of Chinese solar panels at a time when both India and U.S. solar installations are heavily reliant on cheap Chinese panels to keep the costs of their projects low. Domestic demand in China for panels is also picking up, making Chinese panels more expensive. Restricted imports or pricier Chinese panels could damage the Indian solar sector’s ability to build out more capacity. The solar space remains a lively area for growth and experimentation in India. Some of the obstacles, such as distribution company finance, endure. New tensions have emerged as the Indian government would like to revitalize and support domestic manufacturing, including for solar panel manufacturers, which may conflict with its own aggressive solar deployment targets. With energy demand rising slower than expected, India will be faced with more challenges of integrating solar polar as coal plants are run even further below optimal capacity. We look forward to filling you in on developments in 2018 a year from now.